Yet another post on AMD AMF SDK and hopefully a helpful tool reference. I updated one of the capability discovery applications (MediaFoundationDxgiCapabilities) so that it includes a printout of AMFVideoEncoderVCE_AVC related properties similarly as they are printed for Nvidia video adapters. It looks like this tool was not described in detail earlier so one could find other DXGI related information as well (such as, for example, order of enumeration of DXGI adapters depending on whether an app is running on iGPU or dGPU on a hybrid system; DXGI desktop duplication related information). This is reported directly from AMF as opposed to information received from Media Foundation API (which is also partially included though). On video encoders reported via Media Foundation, not just H.264 ones, see MediaFoundationVideoEncoderTransforms: Detecting support for hardware H.264 video encoders. * DEVPKEY_Device_Manufacturer: Advanced Micro Devices, Inc. 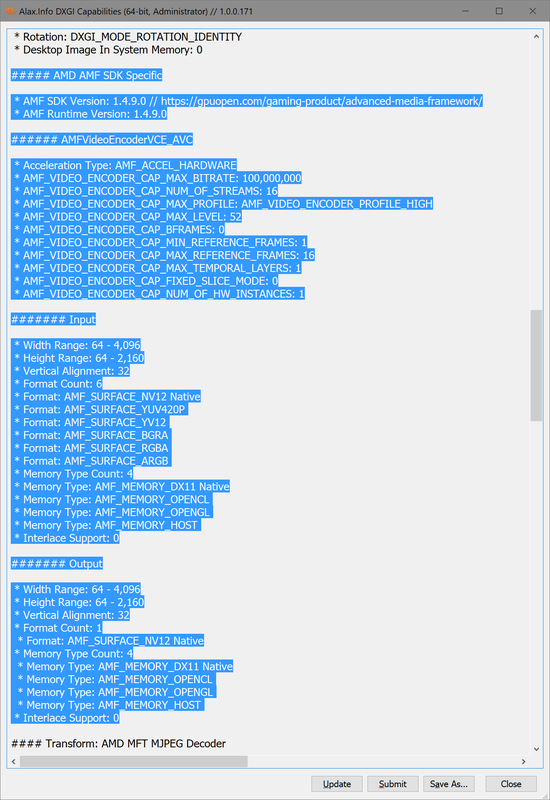 Note that more detailed information can be obtained using amf\public\samples\CPPSamples\CapabilityManager application from the SDK itself, if you build and run it.